Salesforce Transit Center in San Francisco has been closed since September 25 of last year when cracks were discovered in two beams that spanned busy streets that passed under the new transit center. The cracks were in critical and supporting columns were set up so that the structure would be safely supported until the extent of the damage could be reported and appropriate repairs could be made to make the facility once more a viable transit center. Samples of the metal were taken and sent off for analysis. The original drawings were analyzed and the shop drawings for the manufacture of the beams were reviewed by a team of experts. According to ENR , “Last month, the Metropolitan Transportation Commission's peer review panel, overseeing the TJPA's investigation into the causes of the fracture, approved the repair scheme, designed by the project's engineer-of-record, Thornton Tomasetti. Materials for the repair, which also includes the same fix for identical First Street girders that did not fracture, may be available in two weeks, said Mark Zabaneh, TJPA's executive director, at the Jan. 10 TJPA board of directors' meeting." The repair will consist of splints that will be bolted to the damaged area providing additional structural support for the beam that cracked and for a twin beam that did not show any evidence of damage but is being repaired as a cautionary measure to ensure structural integrity and public safety. According to ENR, “The double splint consists of a sandwich of two Grade 70 steel plates, 2 in. thick, and a total of 20 in. wide, on both sides of the web. The bent plates will be a total of 14 ft long, centered at the girder's midspan. There will be 224 bolts, said Dennis Turchon, the senior construction manager for the TJPA. 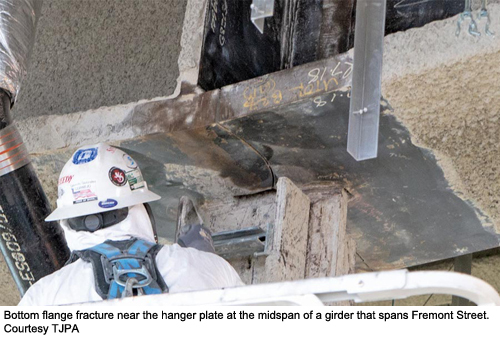 In addition, 8-in.-tall plates will be bolted to each girder’s vertical stiffener." While it appears from the reports that holes cut in the web of the 8-foot-deep beams that allowed welders to make fastening welds and possible manufacturing issues may have contributed to the initial cracking, the final reports have not been issued to the Transbay Joint Powers Authority. The Authority, in its January meeting, authorized the procurement of the materials for the repairs and also approved the further review of all design and shop drawings as a precautionary measure to determine whether there are additional locations in the 1.2 million square foot facility where similar conditions might occur and where additional inspections and testing should occur prior to re-opening the facility for its intended use. The JBPA will receive its next update in its February meeting that is scheduled to be held on Valentine’s Day, February 14 . Hopefully the TJPA will be able to give the transit riders in San Francisco good news and a schedule for the re-opening of the transit center.